The appointed apples fall not far from the corrupt presidential tree. Betsy DeVos—you know, the woman President Executive Order pegged to be the education secretary—looks to have plagiarized at least two of her answers on her Senate-committee take-home exam. 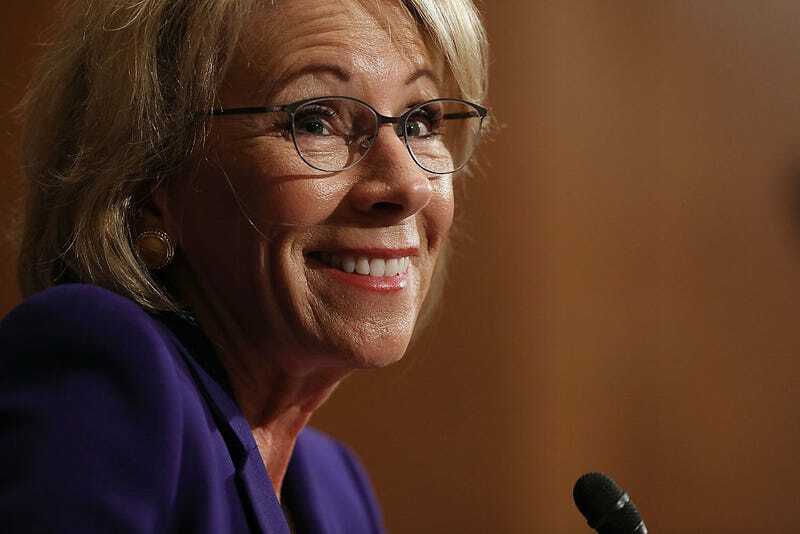 Yet the nomination of the controversial billionaire who never attended a public school in her life narrowly passed a Senate committee by a 12-11 party-line vote. The vote, which pushes DeVos’ nomination to a full Senate vote, came only a day after the Senate Committee on Health, Education, Labor and Pensions received DeVos’ answers to its questions. While CNN couldn’t confirm whether it was DeVos herself or one of her aides who lifted the quotes, the answers, which were given in DeVos’ name, clearly weren’t DeVos’ original thoughts. Because DeVos is not qualified for the position for which she’s been nominated and her confirmation hearing consisted of only one round of questioning, per committee chairman Republican Sen. Lamar Alexander, Democrats submitted over 1,000 questions to the nominee for her to take home and do at her leisure. “In response to a question from Sen. Patty Murray, the top Democrat on the committee, on bullying of LGBT students, DeVos almost directly—and uncited—quoted Principal Deputy Assistant Attorney General Vanita Gupta, head of Obama’s Civil Rights Division at the Justice Department,” CNN reports. The passage in question appears to be lifted almost word-for-word from a 2016 press release from Gupta. “Every child deserves to attend school in a safe, supportive environment that allows them to thrive and grow,” Gupta wrote, and the matter was first discovered by the Washington Post. “To level an accusation against her about these words included in responses to nearly 1,400 questions—139 alone from the ranking member—is simply a desperate attempt to discredit Betsy DeVos, who will serve the Department of Education and our nation’s children with distinction if confirmed,” Goad, who sits on the White House Domestic Policy Council, told CNN. Murray told CNN on Tuesday that she is investigating the material that was submitted by the Michigan billionaire and that, at first glance, some portions appear to have been copied from other sources. DeVos’ nomination now moves to a full Senate vote, for which a date has not been set.